The U18 Coca-Cola Youth Week tournaments continued to deliver top-class action on Wednesday, with six teams still unbeaten at Paarl Boys’ High’s Brug Street Grounds – the DHL Western Province and Build-it Border in the U18 Coca-Cola Craven Week, and the Valke, DHL Western Province, Namibia and Old Mutual Zimbabwe in the Coca-Cola Academy Week. The matches may have been hard-fought, but the players all embraced the spirit of good sportsmanship by participating in the handshake challenge by shaking hands before and after each match. 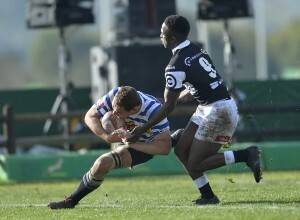 DHL Western Province and the Bidvest Waltons Golden Lions were involved in an epic main game of the day in the U18 Coca-Cola Craven Week, but the home team’s solid forward play and determined defensive effort saw them register a 13-5 victory. The team from the Western-Cape kicked two penalty goals to a try by their counterparts from Gauteng, which saw them take a 6-5 lead at the break. The second half was equally tight, with both sides trying hard to break through the defence, but DHL Western Province crashed through for their only try of the match, by Adrian Alberts, to seal the victory. Build-it Border delivered a committed performance from start to end as they stamped their authority on attack and stood their ground on defence, which saw them power their way to a 52-12 victory against the Thepa Trading Griffons. Their dominant showing saw them cruise to a 33-5 halftime lead, which they maintained in the second half. Jacques Goosen was in sublime form for the East London side as he contributed four of his team’s eight tries. The Blue Bulls XV produced a solid showing thanks to the interplay between their forwards and backs combined with their effective tactical kicking, which paved the way for their 55-5 victory against the Unitrans Limpopo Blue Bulls. Such was the high quality of the Pretoria side’s attack, they ran in an impressive nine tries, with Enrique Coutriers and Junior Snyman earning hat-tricks, while the Limpopo outfit were limited to a solitary first-half try. A strong first-half showing by the King Price Pumas steered them to a 45-29 victory against Eastern Province. The team from Mpumalanga raced to a 33-10 halftime lead thanks to a well-balanced performance and solid defensive effort, while they did well to capitalise on their opportunities. Coenraad Visser, in particular, was in fine form, as he scored two tries and five conversions for a personal tally of 20 points. Eastern Province tried hard to stay in the game, but the Pumas proved too good on the day. In the Coca-Cola Academy Week, the hosts, DHL Western Province, were in top form against the Sharks as they delivered a complete performance to overpower the Durbanites 67-14. Xavier Adams was in superb form as he scored a hat-trick, while Louwan Horn and Raven Smith each scored two tries. The team’s effective defence, meanwhile, limited the Sharks to one try per half for their efforts. Old Mutual Zimbabwe overcame a tightly-contested first half against the Blue Bulls XV in which they held a narrow 15-12 lead to play their way to a 44-19 victory. Both teams tried hard to gain ascendancy in the first half, but the Zimbabweans found their rhythm after the break and used their point-scoring chances effectively to run an in impressive seven tries, while they limited the opposition to a converted try in the second half. The Valke also maintained their winning form in the tournament as they pipped Build-it Border 25-22 in a nail-biting game in which a penalty goal proved to be the difference on the scoreboard. The teams were closely matched on attack and defence, and each earned four tries for their efforts – one of which was converted, but Derik Bierman’s penalty goal proved critical in nudging the team to victory. Namibia ground out a 18-15 victory against Griquas in a hard-fought encounter despite scoring two tries to the opposition’s three, with Aj Zaahl’s conversion and two penalty goals proving invaluable in the result. Boland recovered well from their defeat on Monday as they produced a well-balanced performance to outplay the Pumas 41-24. The side started the clash well as they stuck to their structures and it paid off with a 24-3 lead. They built on this in the second half to increase their try tally to five, while Brent Manuel kept the scoreboard ticking with his five conversions and two penalty goals. The Western Cape side, however, had to work hard to counter the determined Pumas, who fought back with three tries to take their score to 23. The Sharks CD registered their first victory of the tournament as they outscored the Leopards five tries to two for a 29-14 win. The KwaZulu-Natalians led 12-0 at the break and they continued to use their try-scoring chances as the match progressed, with Otto Botha earning brace. Both the Leopards’ tries, meanwhile, were scored in the second half. The SA LSEN (Learners with Special Education Needs) week team staged a dramatic second-half comeback against Valke CD to earn a 26-22 victory, which marked their first win in the tournament. The Gauteng team built up an encouraging 17-0 lead, but the SA LSEN side hit their straps as the match progressed to score four tries, with Mickael Williams earning a brace, while Lourens Lotter scored one try converted three.